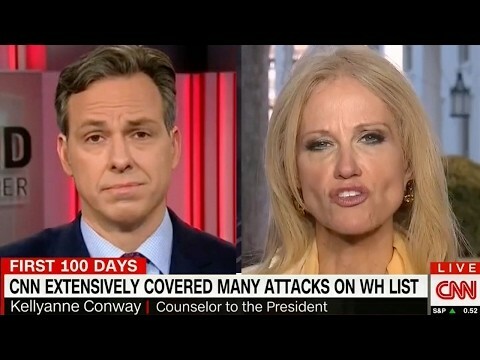 Had the television on CNN while I was having lunch today when I heard the shrill voice of Ms. Kellyanne Conway being interviewed by Jake Tapper. Conway has not been seen much in the past few days after her “alternative facts” blunder on Friday regarding the so-called Bowling Green Massacre incident that NEVER happened. I was surprised to see her on CNN since President Small Hands Tweeted over the weekend that his representatives would not be appearing on several mainstream news outlets including CNN. But this Kellyanne on the screen today, acted as if she had taken a Valium prior to agreeing to the Tapper interview. As you could expect, Tapper asked about Trump’s Monday night delusion that the media is for some unknown reason, not reporting all the terror incidents occurring world-wide. To verify these “facts,” Melisa McCarthy, Sean Spicer provided the media with a list last night of the under-reported terror attacks. As the news outlets that provide “real facts” have reported, many, if not most of identified attacks had been given extensive media coverage. In usual form, Kellyanne tried to steer the conversation into another direction. But Jake was having none of that nonsense today! Each time Conway attempted to avoid answering a direct question, Jake stopped her mid-rant and tried to get her back on point. One of the best exchanges took place when Conway was questioned about Trump’s comment today that crime in the United States is “higher than it has been in 47 years.” As expected, Conway tried to defend Trump’s comments, but Jake quickly put up some FBI statistics, i.e. “REAL FACTS,” that showed just how wrong Trump was. Conway even tried to say that because Trump made these same claims a number of times on the campaign trail, this now made his statistics correct. Now those of us remaining sane know the lunacy of such logic but wouldn’t it be nice if we could get on the scale and say 3 times, “I’m 20 pounds thinner” and the scale resets itself downward? Yes, this is Trump logic at its finest. The NPR has recently taken the position that the media should remain civil and not call Trump’s inaccuracies “lies” or “false statements.” However, as someone who has watched Steve Bannon pull the Trump Puppet Strings and put forth policy by edict that is systematically dismantling our country, it is clear that we are not playing a game with civilized people. As you’ll see in the video below, Jake pulled no punches even calling out Der Pumpkin Fuhrer for the liar he is/has been.